Home » downloader » How to Download MOG Music to Convert MOG to MP3 with MOG Downloader? MOG Music Downloader - How to Fast Download MOG Music Successfully? MOG is an online music service that enables to listen to and read about music. MOG is helping worldwide broadcasters to achieve the highest performance in the most diverse file-based workflows with the development of technology. However, all the MOG music can only be listened online, whether on computers, iTunes, or portable devices like iPhone, iPad, iPod, PS3 and more. How to freely play MOG music? The following article will introduce a professional MOG Downloader Converter as well as a step by step guide on how to download music from MOG to convert MOG to MP3 for enjoying any MOG music offline or play MOG music on iTunes, iPhone, iPod, iPad, PS3 and more. 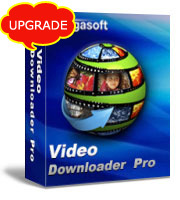 Bigasoft Video Downloader Pro is a professional and specially designed MOG Downloader that can help download any music from MOG sites. In addition, the nice MOG Music Downloader is a good MOG Converter which can help convert MOG to MP3 and more. With the nice MOG to MP3 Converter, it is so easy to play MOG music in iPad/iTunes/iPhone/iPod, PS3, Windows, Mac, Android, BlackBerry and Samsung and more. Besides, MOG Downloader can also help easily download videos and audios from other 1000 video and audio sharing sites like YouTube, Facebook, BBC, eHow, Vimeo, MTV, BBC, Dailymotion, CBS and more. MOG Converter can convert among more than 160 popular video and audio sharing sites with fast speed and high quality. How to Download Music from MOG to Convert MOG to MP3 with MOG Downloader and Converter? The following passage will introduce a detailed guide on how to easily download MOG music with the wonderful MOG Music Download and MOG to MP3 Converter to convert MOG music to MP3 to freely play MOG in iPhone, iPod, iPad, iTunes, PS3, Windows, Mac and more. Free download MOG Downloader Converter - Bigasoft Video Downloader Pro (Windows Version, Mac Version). Launch it and run. Paste the URL of MOG music to download MOG music. To download MOG music in batch, just click "For Multiple URLs". Click the drop-down list of "Download Quality" and set it as "Best Available" or "Normal" to adjust the quality. Go to the "Save to" button to choose the path or folder for the downloaded music. To enjoy MOG music or play MOG in iPhone, iPad, iPod, PS3 and more offline, a recommended solution is to convert MOG music to the popular MP3 format. There are two ways to convert MOG music with MOG Converter. Method One: You can go to the "Download" tab to click the "Automatically Convert to" to convert the music to the file format you want. Method Two: Click the "Convert" button and import the files to the software. 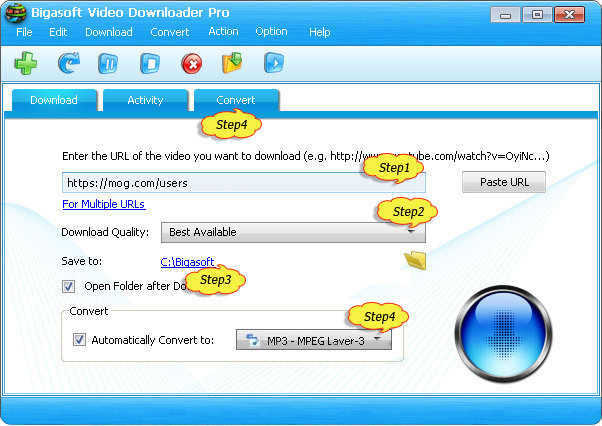 MOG Downloader Converter can also cut videos, increase audio volumes and adjust the video quality. It is so simple to download music from MOG with the wonderful MOG Downloader Converter. Free download the nice MOG Music Downloader and MOG to MP3 Converter to download any MOG music and convert MOG to MP3 to for iPhone, iPod, iPad, iTunes, PS3, Windows, Mac and more now.